This content was published: July 22, 2015. Phone numbers, email addresses, and other information may have changed. 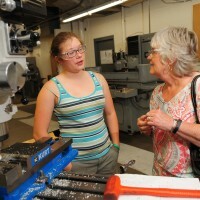 Highlighting girl power and the exponential growth of the new maker movement, the PCC Foundation hosted supporters and sponsors of all things STEAM (science, technology, engineering, art and math) during the 2015 FIRST Robotics and Maker Summer Camps for girls. Earlier this month, representatives of more than a dozen organizations enjoyed lunch with PCC faculty and staff. 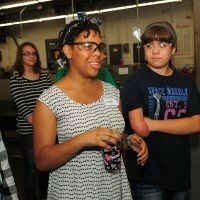 They then visited 24 high-school age students in the all-girls Machine Shop and 3-D Printing Fashion Tech classes. 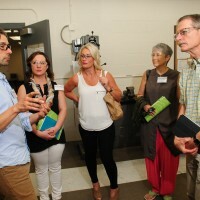 The tours gave Foundation sponsors and supporters the opportunity to see firsthand how the camps they sponsored can inspire tomorrow’s workforce and prepare students for jobs in Oregon’s manufacturing sector. 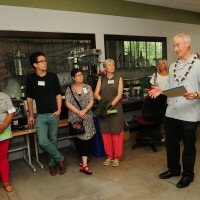 Earlier this month, representatives of more than a dozen organizations enjoyed lunch with PCC faculty and staff. 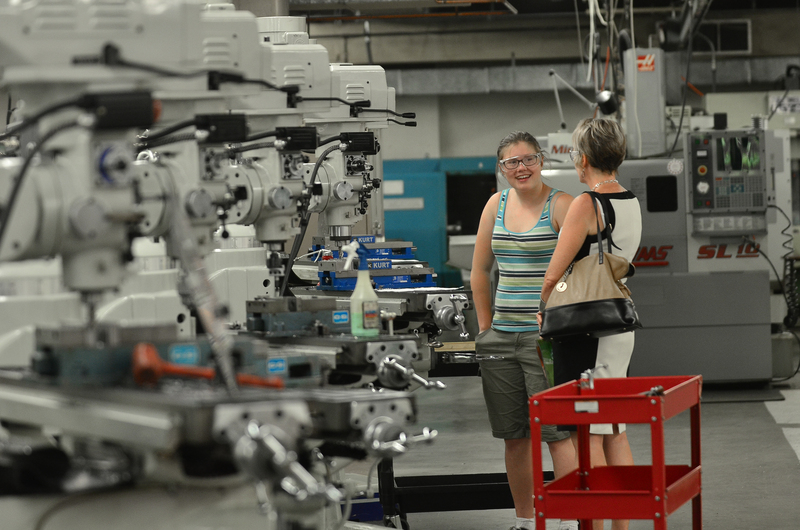 They then visited 24 high-school age students in the all-girls Machine Shop and 3-D Printing Fashion Tech classes. 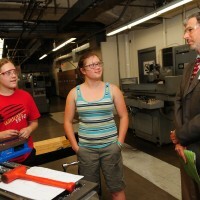 The girls were enrolled in the tuition-free Sylvania camp-style classes for three weeks. 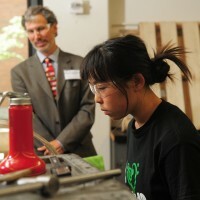 Those who successfully completed the machine shop class became eligible to enter Oregon FIRST’s Robotics competitions in the upcoming winter months. Oregon FIRST (For Inspiration and Recognition of Science and Technology) is a non-profit organization dedicated to inspiring young people’s interest and participation in science and technology. PCC first became involved in FIRST in 2008. In 2013, all-girls camps were added, increasing the popularity exponentially, said PCC Foundation Corporate Relations Officer Matt Chase. Foundation Major Gifts Officer Misty Bouse said that some of the girls in the classes were introduced to them through PCC’s partnership with Adelantes Mujeres. 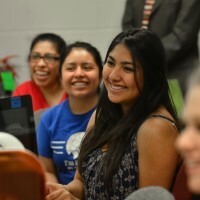 Adelantes is a Forest Grove-based organization that sponsors and promotes programs dedicated to inclusion in education, job training, employment and cultural leadership development of college and high school students of Latina heritage. 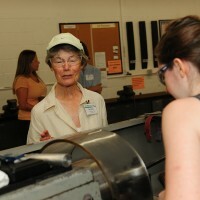 Chase said that given the popularity of the Girls Machine and MakerSpace Camps, the tour was an excellent opportunity to showcase the college’s STEM and career technical education programs. It was also a chance to invite new partners, like the Girl Scouts of Oregon and Southwest Washington and the Portland STEM Partnership. Guests at the tour and luncheon included: Intel Foundation, Mentor Graphics &Foundation, The Juan Young Trust, The Wheeler Foundation, Oregon Department of Education, Cher Hinerman, FEI Company, Qorvo Semiconductor, Xerox Corporation, Viewpoint Construction Software, Artemis Consulting, CH2M Hill, Foster & Associates, Beth Madden, and sponsors Port of Portland and ESCO Corporation. I think that this is a great thing PCC is involved in and it’s something I wish was around when I was in HS. Wonderful!